Sampling for invertebrates may help us find biological impacts. There are not many pristine water bodies left in Washington State. Most of the water bodies we want to protect or restore are eutrophic, polluted and deteriorating. We strive to involve communities, motivate political action, and understand the science of how our lakes operate. Perhaps our goal is to decrease internal phosphorus loading, prevent cyanobacteria blooms, protect against invasive species, or lessen pollutant bioaccumulation. No matter your lake’s problem, we all want the same outcome: clean water. It seems only fair that we provide the same amazing beauty and resources to future generations as was provided to us. The journey I am taking you on is probably not much different than your lake’s story. It is a story with a giant polluter, and several impaired water bodies. The best place to start my story is at the beginning. In 1896, one of the largest non-ferrous lead/zinc smelters in the world came online. The smelter is located about 10 km north of the United States/Canada border in Trail, British Columbia. Initially the smelter began processing copper and gold ores, but quickly added lead and zinc ores. Perhaps the best way to paint the picture of Trail in the early 1900’s is to tell you the local hockey team’s nickname: The Smoke Eaters. In the early 1900’s, Trail residents realized smelter emissions damaged their crops, livestock and way of life, and after settlement, the smelter operators decided to build taller smoke stacks (409 ft). Their goal was to clear the air in Trail, but making the stacks taller just broadened their impact zone. In the 1930’s, farmers, ranchers and foresters in Northport, Washington sued the Trail smelter for damage to resources. Reports suggest that over a 60-year period the smelter dumped 9.8 million tons of slag directly into the Columbia River, and sulfur dioxide fumes from the smelter have damaged vegetation 30 miles downwind. Recent work in the upper Columbia River watershed has focused on diagnosing the extent and severity of pollution from Trail’s lead/zinc smelter. 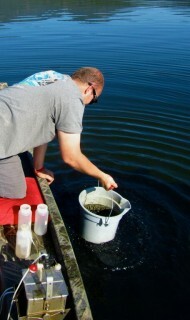 In 2010 and 2013, the Washington Department of Ecology compiled reports on sediment metal concentrations in lakes in the upper Columbia watershed. However, little work has yet been completed to connect this pollution directly to the Trail smelter, or to figure out the extent of the metal deposition footprint and its biological impacts. We know direct discharge of heavy metal waste from mining and smelting operations into adjacent streams, lakes and rivers can cause long-term biological impacts for both these ecosystems and humans that come in contact with the polluted water bodies. Aquatic insects (e.g., chironomid fly larvae) are well-documented biological indicators of heavy metal pollution, which can induce mouthpart and antennal deformities in insect larvae. These deformities have been suggested as strong indicators of sediment toxicity, and several studies have used their presence in river systems to document biologic damage from metal pollution. Less appreciated and researched are the biological impacts of heavy metal pollution from atmospheric deposition that originates from smelting operations. 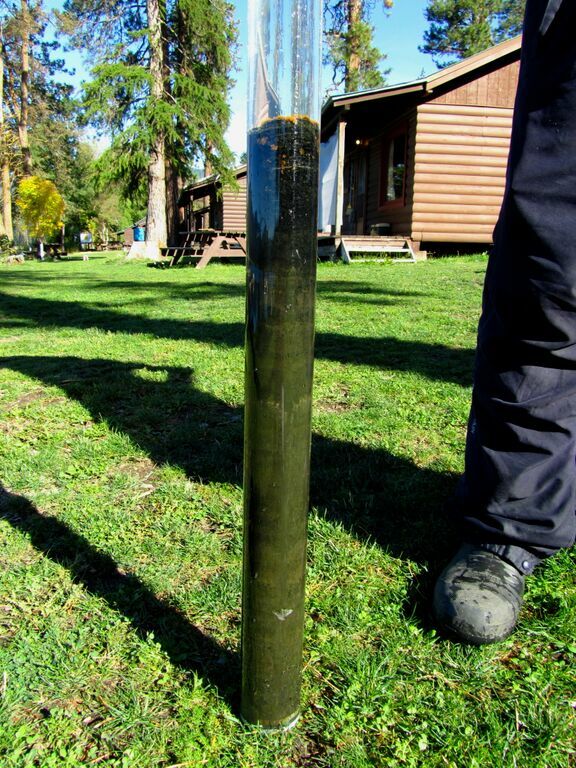 Sediment cores were collected from each lake. My research has three objectives: 1) determine the severity and extent of long distance (>75 km) atmospheric transport of heavy metals from the smelter into remote upland lakes, 2) discern possible origins of heavy metal deposition (even if in low concentrations) using lead isotopes, and 3) diagnose whether there are biological impacts from metal pollutants on impacted lakes by examining insects in lake sediments. 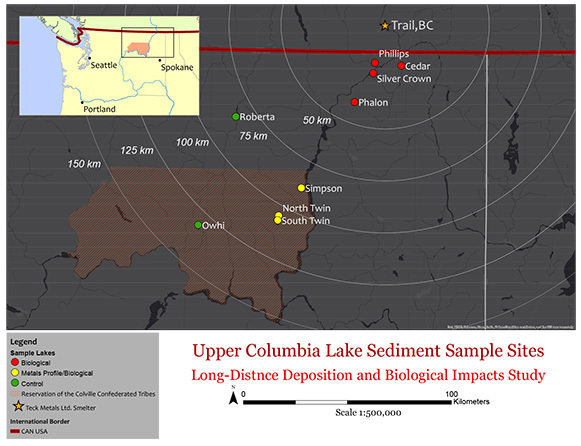 We identified three upland lakes in northeastern Washington that may be impacted by long distance deposition from smelting operations: Simpson (86 km away), North Twin (103 km), and South Twin (105 km); and two control lakes: Roberta (80 km),and Owhi (130 km). From the deepest portion of each lake, we collected three intact sediment cores to get date estimates, sedimentation rates, heavy metal (i.e., mercury, lead, zinc, cadmium, antimony, nickel, and arsenic) concentrations, carbon and nitrogen isotope analysis, percent organic matter, lead isotope ratios, and biological data (e.g., chironomid remains). We added four lakes for biological assessment: Silver Crown, Phillips, Cedar, and Phalon. Less than 50 km from the smelter, these four lakes are at high risk for biological impact based on sediment assessment by previous investigators. 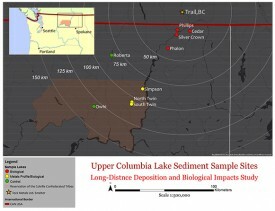 Heavy metal deposition in lakes appears to be controlled by two factors: 1) distance from the smelter, and 2) distance from the Columbia River Canyon. Previous work from the Department of Ecology has shown that prevailing winds blow down the river canyon, and that distance down canyon greatly decreases metals deposition. We are working to determine whether lakes >75 km from the smelter are part of the smelting footprint, even though they have reduced concentrations of metals deposition. Lead isotope analysis is a powerful technique that can be used to track metal deposition. Lead has four stable isotopes: 204, 206, 207, and 208. Because the latter three are the products of the uranium and thorium decay series, over long periods of geological time geologic formations can develop unique isotope ratios. Thus, lead isotopes are often used to estimate the time at which a geological material formed. Lead and zinc ores can have a unique isotopic ratio based on when they were originally formed. Furthermore, lead isotopes don’t fractionate in the smelting process, so the ratio of lead isotopes is the same in the ore, and in the emissions or slag from processing that ore. This is good news if you are trying to trace emissions from a smelter that used the same ore for 85% of its peak operation, and if that ore has a unique isotopic ratio compared to ores in the surrounding area. In fact, that is exactly the case study we have in front of us. Preliminary results from our lead isotopes suggest the smelter’s footprint may extend >80 km downwind of the smelter, which could mean that low levels of metal in remote lakes may be from the smelter. We are currently processing core profiles to determine dates for the onset of this pollution, and if we can discern possible contamination at >100 km. We are also processing profiles to compare mercury deposition within the lakes. Currently we only have mercury deposition profiles from Twin Lakes (~100 km from Trail), and the dates associated with these profiles match nicely with the Trail smelter operation timeline. Now it’s time for my conclusions… Oh wait, I don’t have any yet, which means pack your bags and get ready for an amazing WALPA conference in Walla Walla, where you can hear the rest of this story. At the conference, I will present updated information on how far smelter emissions have traveled from Trail, and the biological impacts of metal deposition in lakes. The story of Trail is not much different from that of impaired lakes you work with every day. For all of us, protecting the lake is our goal. On my journey to become a lake scientist I have realized two “truths”, if I can call them that: 1) people who take an interest in clean water do not like their favorite water body to deteriorate, and 2) if they figure out who is responsible for its deterioration, they get even more furious. But maybe instead of getting furious, we should seek to inspire young people to change how we treat and investigate the world. Maybe then the water bodies that we love will be those they work to protect or restore in the future.